Thierry Dodin and Kerry Moran for reviewing prior to publication, and Nico Correia for updating. 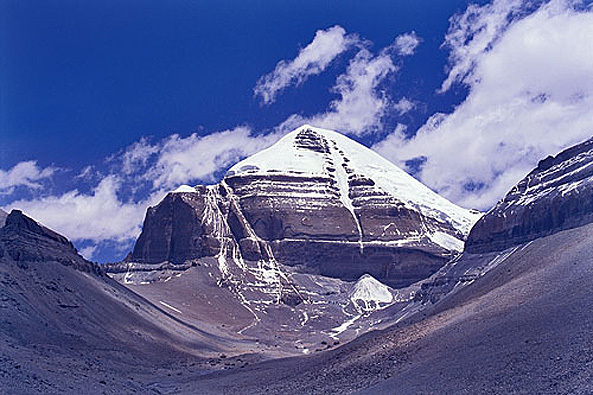 Both geography and mythology play roles in the sacred significance of Mount Kailash. At just over 22,000 feet, Kailash can’t compete with peaks in the nearby Himalayan range, which includes Mount Everest. Its grandeur lies not in its height but in its distinct shape—four sheer faces matching the cardinal points of the compass—and its solitary placement, free from neighboring mountains that might dwarf or obscure it. Kailash is regarded as the earthly manifestation of mythic Mount Meru, or Sumeru, the spiritual center of the universe in Hindu, Buddhist and Jain cosmology. This great mountain was believed to be the source of four life-giving rivers, and indeed, the Indus, Brahmaputra, Sutlej and Karnali, which is a major tributary of India’s sacred Ganges, begin in the area surrounding Kailash. To Tibetan Buddhists, Kailash is the abode of the tantric meditational deity Demchog. Hindus see Kailash as the throne of the great god Shiva, one of the most significant deities. Jains revere Kailash as the site at which their first prophet received enlightenment. And long before Buddhism took root in Tibet in the 7th century A.D., Kailash was venerated by the Bönpo, practitioners of the indigenous religion of the region. Pilgrims journey to Kailash to complete a 32-mile ritual circumambulation. Most take one to three days to complete the circuit, although some devotees spend up to a month doing full body prostrations along the ground. All pilgrims respect the sacredness of the mountain by not climbing it. Along the route are monasteries and points of spiritual significance and ritual: natural stone carvings revered as footprints of the Buddha, rock formations representing mythological forms, places where pilgrims gather mementos and others where pilgrims leave behind offerings such as a lock of hair or a tooth. Kailash, which lies in the remote southwestern region of Tibet near the borders of India and Nepal, is far from any population centers and is not easily accessible. However, for most Buddhists and Hindus of Tibet and India, the journey to Kailash is the most important pilgrimage they can make. From the 7th century, when Tibet began to emerge as a unified nation, the country enjoyed relative autonomy. However, in 1950, Communist China invaded Tibet. The Tibetan government, headed by the recently enthroned 14th Dalai Lama, was forced to sign an agreement for the “peaceful liberation” of Tibet or face further military action. In 1959, following a failed Tibetan uprising, the Dalai Lama fled to India and established a government in exile. At that time, the Hindu pilgrimage route to Kailash was closed. China abolished the Tibetan government and imposed societal changes based on Marxist principles. The situation worsened during China’s Cultural Revolution of 1966-1976, when religious practice was forbidden and Chinese forces set about destroying Buddhist and Bön monasteries, including six at Mount Kailash. In the mid-1970s, China began to soften its stance and by the ’80s, Tibetans had regained some religious freedom. Monasteries that had not been destroyed began to reopen and confiscated religious artifacts were returned. Indian pilgrimages to Kailash resumed, and in 1984, the area around Kailash officially opened to Western visitors. Nevertheless, incidence of human rights abuses and religious repression remain high and Tibet’s political situation is still volatile. More than 50 years after the so-called liberation of Tibet, more than 1.2 million Tibetans have died, tens of thousands more have been forced to flee the country, and more than 6,000 monasteries have been destroyed by Chinese forces. Chinese control of Tibet continues to affect Mount Kailash and religious practice there. Although the Chinese constitution allows for freedom of religious belief, the government tightly controls religious practice and is quick to suppress religious activities that could be viewed as modes of popular organization and political dissent. Because of its ties to the Dalai Lama, Tibetan Buddhism is a particular target of government suspicion. Monks and nuns at Buddhist temples may face expulsion from religious sites if they fail to sign declarations agreeing, among other things, to denounce the Dalai Lama’s political authority and recognize the unity of China and Tibet. While the Chinese government limits access to Kailash by religious pilgrims, it is promoting the sacred mountain as an international tourist destination. In recent years, China has been developing infrastructure in the Kailash area, building roads and bridges and installing telephone lines. Along with development come fears of environmental damage and the destructive effects of commercial tourism on an already vulnerable culture. Another concern is whether China will preserve and respect the sanctity of Kailash as it promotes the sacred mountain’s tourist appeal. The government touted 2002 as a “year of tourism” in the Kailash region and a Chinese-style gate was constructed at the approach to the mountain, in obvious disregard to traditional culture. In 2006 China launched a train line linking Lhasa (SE of Kailash) to Beijing and other Chinese cities, which only promises to increase tourism volume. The past decades have seen some recovery from the damage inflicted by the Cultural Revolution. The Chinese government claims that it has spent more than $74 million on the restoration of Buddhist sites in Tibet. Private funders have also aided restoration efforts. At Mount Kailash, monasteries, temples and other religious structures have been rebuilt or restored, and the Chinese government has returned some of the few religious artifacts that were not destroyed. Recent reports on human rights in Tibet indicate that major religious festivals such as Saga Dawa are being celebrated somewhat more openly than in previous years. An estimated 20-30,000 pilgrims came to Kailash for Saga Dawa in 2002. In continuing to complete pilgrimages and hold festivals at Kailash, the Tibetan people are preserving both their cultural identity and the sanctity of the place. Indian pilgrims are enjoying somewhat greater access to Kailash: in 2006 China agreed to increase the annual number of pilgrims from 700 to more than 900. China has also agreed to explore the possibility of opening another pilgrimage route from India. International support for the Tibetan people and the sanctity of Mount Kailash has aided its preservation. In 2001, a team of Spanish mountaineers requested permission from China to climb the mountain. Following tremendous international protest, the team withdrew its permit request, and when India raised the issue with the Chinese government, Beijing asserted that it would not permit climbing activities at Kailash. In 2003, China initiated plans to build a highway around the mountain to increase access for tourists. It went as far as completing the survey work but ultimately abandoned the project in the face of a worldwide letter-writing campaign against it. Preservationists contend that designating Mount Kailash as a UNESCO World Heritage site would do much to protect this sacred place, but this can happen only if the Chinese government requests its nomination. An easing of political tensions, leading ultimately to a freer Tibet, would arguably serve to protect Mount Kailash. Beijing has recently expressed a greater willingness to work with the Dalai Lama, who does not advocate an independent Tibet but an autonomous Tibet. In September 2002, two of the Dalai Lama’s representatives traveled to China and met with a number of government officials, marking the first formal contacts between the Dalai Lama’s representatives and the Chinese government since 1993. Two senior envoys completed nine rounds of talks with China from 2002 to 2010, but resigned in 2010 citing frustration with the deteriorating situation inside Tibet and China’s rejection of the Dalai Lama’s call for “genuine autonomy” for Tibet. An autonomous Tibet, with greater religious freedom, could enable stronger protection of Mount Kailash and religious practice there. 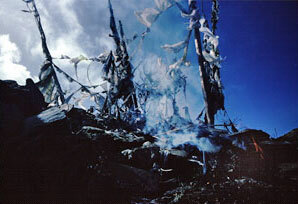 However, a free, independent and sovereign Tibet might truly protect the sacred mountain. Recently, a transboundary collaboration between China, India and Nepal created the Kailash Sacred Landscape Conservation and Development Initiative, which aims “to achieve long-term conservation of ecosystems, habitats, and biodiversity while encouraging sustainable development, enhancing the resilience of communities in the landscape, and safeguarding the cultural linkages between populations.” This initiative, coordinated by the International Centre for Integrated Mountain Development (ICIMOD), comprises a landscape of 31,000 square kilometers, including pilgrimage trails, cultural heritage sites, Mount Kailash, Lake Manasarovar and over one million people. The initiative emphasizes the value associated with sacred places to protect biodiversity and asserts that local practices, values and sentiments should be respected and given due recognition when developing a policy framework for the management and conservation of the Kailash Sacred Landscape. The ultimate goal is to declare the Mt. Kailash area a World Heritage Site. If you visit Mount Kailash, be observant and respectful of the sanctity of the place and the beliefs of those who are there for religious reasons. Do not climb the mountain. For more thoughts on the ethics of visiting a sacred place familiarize yourself with these guidelines. You can also help protect Mount Kailash by supporting organizations that work for greater freedom in Tibet. See the International Campaign for Tibet web site, which urges China to engage in serious dialogue with the Dalai Lama about Tibetan human rights. Johnson, Russel and Kerry Moran. Tibet’s Sacred Mountain: The Extraordinary Pilgrimage to Mount Kailas. Park Street Press, 1999. Snelling, John. The Sacred Mountain: The Complete Guide to Tibet’s Mount Kailas. East-West Publications, 1990. ICT. International Campaign for Tibet. U.S. Department of State. “Tibet.” International Religious Freedom Report 2006.